We in the North Bay love visiting historic sites. Not just important locations in classroom history, either. We like to drive by a place and say things like "That's where Lance Armstrong ate when he was in town," "Barbra Streisand stayed at this hotel in the 1970s," and—perhaps with a tone of caution—"These are the mountain bike trails once rode upon by George W. Bush." And there's no local quip like a movie-related local quip. The North Bay has had an up-and-down relationship with Hollywood filmmaking, from Hitchcock's The Birds and Shadow of a Doubt and the presence of icons like Francis Ford Coppola and George Lucas to one of the biggest Hollywood battles in local history. Scream, the 1996 Wes Craven horror film that went on to make $173 million at the box office, was originally set to be filmed at Santa Rosa High School. But parents were worried about glorifying violence on a school campus, and after months of the school board delaying filming, Craven was forced to film in Sonoma instead and kill off his big star, Drew Barrymore, within the first 12 minutes of the movie. He famously retaliated in the film's closing credits: "No thanks whatsoever to the Santa Rosa City School District Governing Board." The controversy was not without precedent. One rallying cry among concerned parents around the Scream brouhaha was "We don't want another Smile, do we?" Smile, a brilliant satire of small-town beauty pageants, was also filmed and set in Santa Rosa in 1975. But the film's irreverent skewering hit a little too close to home for residents, whose excitement turned to scorn upon its release. Since, we've been a too-cautious bunch toward Hollywood, and vice-versa. Five years after the Scream debacle, when the Coen brothers made The Man Who Wasn't There—their declared homage to Shadow of a Doubt—they set the story in Santa Rosa but tellingly filmed it elsewhere, in Orange County. Just this month, George Lucas bitterly shelved plans to build a movie studio in Marin over protests by homeowners in nearby upscale Lucas Valley Estates, and vowed instead to sell the land for low-income housing. There are dozens of films we coudn’t fit here—Bottle Shock, Phenomenon, A Walk in the Clouds, All My Sons, Inventing the Abbots, Impact, Happy Land and so many more. 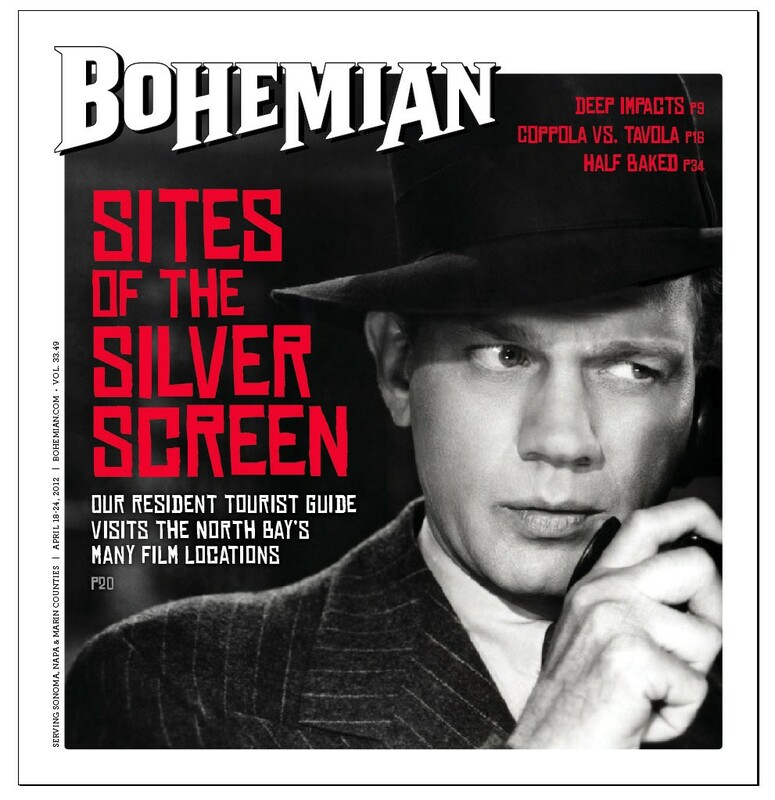 But we've also tried to dig a little deeper beyond the usual suspects of locally shot films, and hope you'll learn more about Hollywood history in the North Bay. The ultimate Santa Rosa movie, Alfred Hitchcock's 'Shadow of a Doubt' (1946) contains vivid scenery and small-town charm galore. 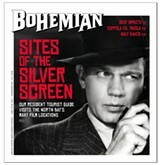 Hitchcock himself called it his favorite of his films, and though Joseph Cotten and Teresa Wright are the film's top two stars, third billing would have to go to 1940s Santa Rosa itself for providing a perfect setting of quaint innocence for the story's sinister undercurrent. Cotten's dark nature is foreshadowed as his train pulls into the Santa Rosa train station, emitting a huge cloud of black smoke—a pure Hitchcock touch. The depot is still there today at Fourth and Wilson, as is the Western Hotel, seen in the background (it's now Flying Goat Coffee), and Hotel La Rose. Sadly, almost all of Santa Rosa's downtown today is unrecognizable from the film. The towering courthouse was torn down in 1966. The ivy-covered Carnegie library, where young Charlie asks for a newspaper late at night, was demolished in 1964. The American Trust building where Uncle Charlie makes a deposit, also gone, and the Tower Theater, where young Charlie runs into some friends, torn down. The Til-Two bar, once at the southwest corner of Third and Santa Rosa Avenue, is an empty commercial building. The white church at the close of the film is now a concrete parking garage. However, a few features remain. 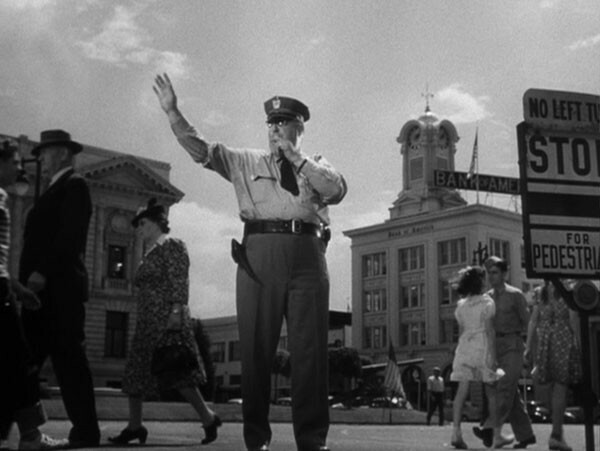 Scenes of a policeman directing traffic on Fourth Street show the Empire Building and its still-working clock tower. On her way to the library, young Charlie walks by Arrigoni's Market, on Fourth and D—squint and you can see the sign—which is still there. The Rosenberg Building at Fourth and Mendocino is still the same, now home to Pete Mogannam's Fourth Street Market. And when Uncle Charlie leaves Santa Rosa, in the background is a vaguely Spanish-style building, which still stands as Chevy's restaurant. When director Michael Ritchie included a scene filmed at Santa Rosa's Howarth Park in the 1972 Robert Redford vehicle The Candidate, he took note of the city as a perfect backdrop for small-town dysfunction. A few years later, in 1975, 'Smile' took advantage of the all-American town gone awry: the cops are horny, the parents are drunk and Santa Rosa is a barren wasteland. Locals hated Smile upon its release, but there's a lot to love in the film's very funny, insightful skewering of young-miss beauty pageants, with performances by Bruce Dern and, in an early role as a beauty contestant, Melanie Griffith. Anyone who lives in Santa Rosa should seek it out. 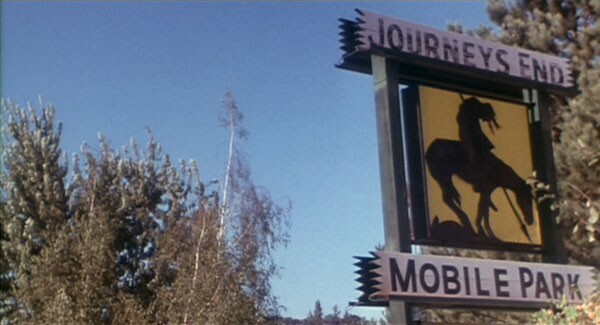 Watch for the opening montage with scenes of Highway 101, Coddingtown, Denny's and the Journey's End mobile home park. Most of the film is shot at the Veterans Memorial Building on Maple Avenue, across from the fairgrounds, where all the beauty-pageant action takes place. Certain scenes were filmed on Stevenson Street, behind the Vets Building. Bruce Dern's car lot is on Corby Avenue (you can see the Chevrolet sign in the background), and at one point he takes his son to Community Hospital on Chanate Road. There's also a bizarre fraternal-club initiation in Howarth Park, which is changed to "Ripley Park" in the film. A disturbing coming-of-age drama, 'Smooth Talk' stars Laura Dern as a bored yet sexually aroused 15-year-old, and Treat Williams as a smooth-talking sexual predator—and was filmed, in 1985, largely at a Sebastopol Victorian home and two shopping malls in Santa Rosa. In the movie, the vintage home at 2074 Pleasant Hill Road where Connie and her family live is being painted white by Connie's mother (Mary Kay Place). Today, the house is pink and can be seen from the road through the filter of the same apple trees, but now boasts a renovated front porch, landscaped flower gardens and a paved driveway. The current owners who moved there in 1995 recall being told about the movie by local apple farm workers, who said the house was chosen because it was so run-down. For decades, those enamored of Shadow of a Doubt have long missed the opportunity to see another black-and-white film shot on location in Santa Rosa: 'Storm Center' (1956), starring the great Bette Davis. In it, Davis plays a librarian who refuses to remove a book, The Communist Dream, from the downtown library. She is fired by the city council and her alleged red ties are scapegoated to advance the campaign of a local politician. The film had been unavailable on VHS, and then DVD, for years. In 2010, Sony finally released a master on DVD. That may be because it's not a very good film. It tries and ultimately fails to make an emotional connection, although it deserves credit as the first movie out of Hollywood to bravely take McCarthyism head on. Not only is Davis' character scorned in the film, but according to Turner Classic Movies, "during the shooting of the film in Santa Rosa, local women's groups harassed Davis with letters warning her of the film's dangerously subversive content." Davis didn't land a major feature role for another five years. Storm Center takes place mostly at the beautiful old Carnegie library on Fourth and E, where only a cornerstone remains—it was torn down in 1964. There's a town meeting at a recognizable hall that's now the Masonic Lodge on Seventh and Beaver, and quick scenes in front of the old courthouse, now torn down. 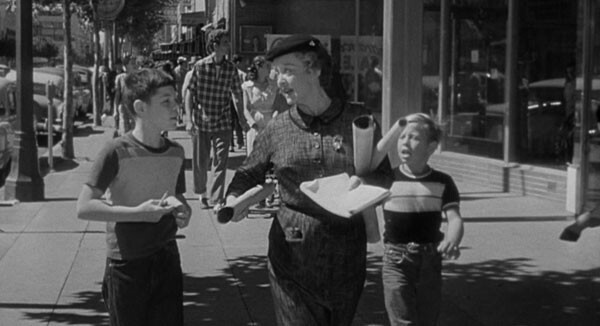 Watch for a scene where Davis is chatting with local children—she walks down the 700 block of Fourth Street, and you can make out the storefronts of what used to be Sawyer's News and the Last Record Store (it's now Simply Chic).